Chikkaballapur is the district headquarters of the newly created Chikkaballapur district in the state of Karnataka, India. It is located within 3 km of Muddenahalli (the birthplace of eminent engineer and statesman Sir Mokshagundam Visvesvarayya). A $400 million Pharmaceutical SEZ is coming up in Chikkaballapur on 325 acres (1.32 km2), the first of its kind in India. Furthermore, the noted Traveler Bunglow is being converted into a state of the art Bus terminus. A new District Government Headquarters and police headquarters is being constructed at a cost of $5 million. In addition, the state government is releasing over $10 million to develop the city and expand underground sanitary systems. It is a regional transport and educational hub, and is a major site for grape, grain, and silk cultivation. With recent development, it is widely believed that Chikkaballapur will become part of "Greater Bangalore." In the regional language, Kannada, the city is pronounced Chikkaballapura. "Chikka" in Kannada means "small", while "balla" means the measure to quantify food grains, and "pura" means "town". Thus, it is a place where people used to use small measures to quantify the food grains in ancient times. The place has always been known as an agricultural center for the region. The ruler of Avathi Mallabiregowda's son Marigowda was hunting one day in Kodimanchanahalli forest. A rabbit stood in front of the fierce hunting dogs without fear. Seeing this, ruler was elated and told his son that the strength of the rabbit is due to the valor of the region's citizenry. As such the ruler took permission from King of Vijaynagar and built an elaborate fort and formed a city which is now known as Chickballapur. Baichegowda, King of Mysore later attacked the fort but had to withdraw due to the valiant efforts of the Chikkaballapura citizens and aid from the Marathas. Sri Dodda Byregowda who came to power after Baichegowda acquired the land, which was taken by Mysore king. In 1762 during the ruling of Chikkappanayaka, Hyder Ali captured the town for a period of 3 months. Then Chikkappanayaka agreed to pay 5-lakhs pagodas, and then the army was taken back. After this, Chikkappa Nayaka with the help of Murariraya of Guthy tried to restore his powers. He was hiding at Nandi Hills along with Chikkappa Nayaka. Immediately, Hyder Ali acquired Chikkaballapur and other places and arrested Chikkappa Nayaka. Then with interfere of Lord Corn Wallis, Chikkaballapur was handed over to Narayanagowda. After knowing this, Tippu Sultan again acquired Chikkaballapur . In 1791 British occupied Nandi & left Narayanagowda to rule the town. Due to this treachery, a fight broke out between the Britishers and Tippu Sultan. Narayanagowda lost his administration. Later, the British defeated Tippu in a bitter battle which led to tremendous loss of life on both sides. The citizens of Chikkaballapur, however, refused to be subjugated and maintained their warrior pride. Chikkaballapur later came under the administration of Wodeyars of Mysore, who later merged with the present state of Karnataka. As of 2011[update] India census, Chikkaballapur had a population of 191,122. Males constitute 51% of the population and females 49%. Chikkaballapur has an average literacy rate of 64%, higher than the national average of 59.5%. 11% of the population is under 6 years of age. Nandi Hills is nearby and within the jurisdiction of Chikkaballapur district. The nearby region of Muddenahalli is the birthplace of legendary engineer Sir Mokshagundam Visvesvarayya. Hossur is the birthplace of Dr. Hosur Narasimhaiah, the great educationalist and thinker. Chikkaballapur has the small, pristine Kandavara Lake. S. Gollahalli Village Sri Anjaneya Swami temple is an important place to visit. "Vidurashwattha" is in Gauribidanur taluk on the lands of river Pinakini. "Vidurashwattha" is famous for Temple. It is also called as Mini Jaliyanwalabagh. There are several reputed educational institutions in the region. SJCIT is an engineering institute established in 1986 and imparts degree and graduate education. Sri Bhagavan Sathya Sai Baba's school, university, and hospital are about 3 km from Chikkaballapur. 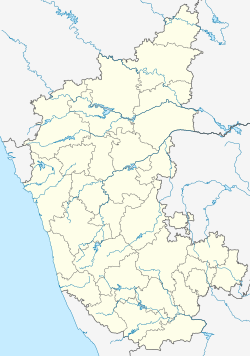 The Chikkaballapur District includes the taluks (townships) of: Chikkaballapur, Gauribidanur, Bagepalli, Sidlaghatta, Gudibanda, and Chintamani. ^ "'Chikkaballapura slated to become part of Greater Bangalore'". The Hindu. Chennai, India. 28 January 2010. Wikivoyage has a travel guide for Chikballapur. This page was last edited on 17 October 2018, at 10:57 (UTC).